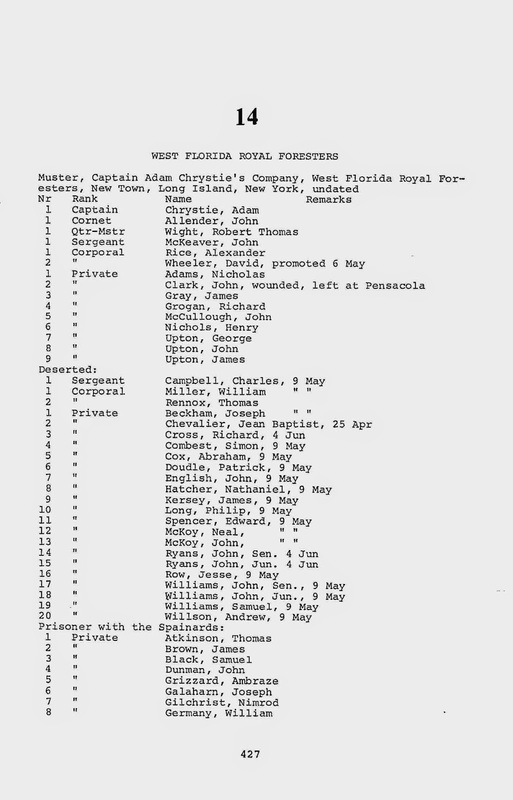 The oldest document (screen capture above) that we have about Philip Long is a muster roll where he is listed as a « deserter » in a Loyalist regiment called the West Florida Royal Foresters (WFRF). Any member of my family would prefer a more noble event for his ancestor. The reaction of some could be to negate the validity of this document or to maintain that it must belong to another soldier by the same name. So, rather than taking this low punch, let’s erase that document from our ancestor’s military file. Easier said than done! NOTE. It is important to know that the WFRF was a Provincial Loyalist regiment and not a militia regiment. A militia was raised to protect the citizens within a certain area in case of attack or threat of attack. A Provincial regiment was also raised with ordinary citizens, but they would be asked to travel outside the area where it was raised. Consequently, the soldiers would be asked to sign up for many weeks at the time. It is not surprising to see their name on a three-month muster roll and not on the next muster roll. They were allowed to return to their home to attend to their family. Generally, they would come back. 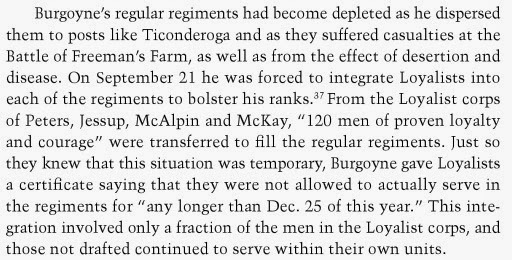 It is also interesting to note that some soldiers, like Philip Long, were present in the Provincial regiment on a continuous basis. In fact, they were considered as regular professional soldiers, as if the army was their family. Nobody has ever been able to pin the name Philip Long on another soldier’s back. And the more you search for a dummy soldier, the harder it becomes to get rid of this military document. But, if you read about the ARW, you cannot stop thinking that this document could very well be about our ancestor. 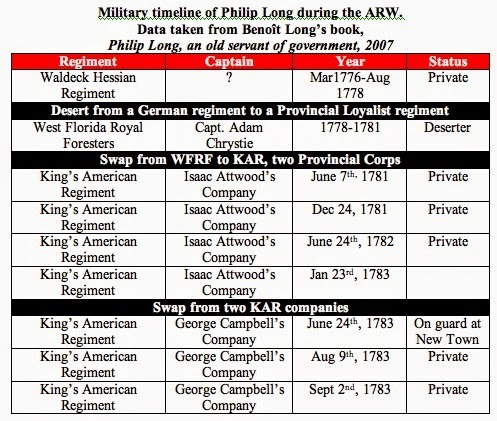 It seems reasonable and logical that Philip Long from WFRF became a soldier in the King’s American Regiment. The actual result of my research not only leads me to believe that this document is about my ancestor, but there is more to it, a whole lot more. There are many circumstancial evidence that point in that direction. 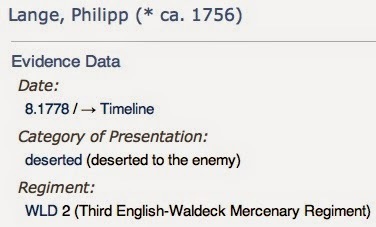 It’s no secret now that my main hypothesis simply states that Philip Long was a Waldecker mercenary soldier who arrived in America in 1776 under the name of Philipp Lange. Lower, there are three screen captures taken from his Marburg military file. It says one thing: he was part of the ARW from 1776 until August 1778, and in 1778 he deserted from his regiment, the Waldeck. Philip was enlisted in the army before March 1776. So, he could have joined the Waldeck regiment some time in 1775. For a period of three years in America, there is no document to show where he was or what he was doing between 1778 and 1781. Suddenly, in 1781, he popes up at Savannah, Georgia. He reappears again during that same year in another muster role and, from then on, we have a trail of muster rolls showing him in the King’s American Regiment until the end of the ARW. Here is a summary of his military life during the ARW. On the spur of the moment, you might ask: « Was Philip a soldier or a butterfly? Was he the only one to desert and go from one regiment to the next? » In a previous section of my blog, I dealt with that issue of desertion, and I will deal again with it in this section. I hope that your perception of desertion during the ARW will change somewhat as much as mine did and will continue to change. Any war brings humans to become cruel, nasty, deserters, liars, killers, all of them behaviors that we qualify as barbaric: war brings the worst in human beings. Let’s go directly to an important event of the ARW, the Pensacola Siege, the result of which changed the course of the ARW. 3. Was Philip Long in Pensacola in 1781? Benoît Long asked this question in his book about our ancestor. He went to quite an extent in trying to solve a dilemma in the military life of Philip. I will demonstrate that the reason why he couldn’t solve the problem is simply because the problem didn’t exist to start with. Here is a title taken from his document written in 2007. At least, Benoît was able to define clearly the dilemma posed by the lack of adequate documentation about Philip’s military and civil lives. First, Benoît didn’t seem to understand that a soldier didn’t have to be present in the loyalist main office in New York to be mustered in a new regiment or company. The soldier could have been mustered on the battlefield one thousand kilometers away and could even switch regiment. The muster roll is completed by the captain of the Company and sent (or brought) to the main office afterwards. The soldiers don’t have to run to the main office to be mustered. This notion is very important to understand the life of Philip from 1781 to 1783. And there is more to it, much more. NOTE. According to Todd W. Braisted, The WFRF was raised in Tansa, Florida, on March 13, 1780. Let’s not forget, also, that the WFRF was a cavalry loyalist regiment. In order to answer those tricky questions of Benoît, it is absolutely necessary to understand what went on before 1781 in the area of Florida. 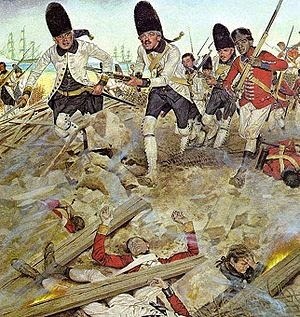 In 1778, Britain was loosing ground in the north and decided to send troops down south at the same time, hoping to maintain their control pver those southern colonies. In October, Britain named John Campbell as the commander-in-chief of the army in the Province of Florida and sent him in Pensacola, Florida, to organize the resistance against the Continentals and, also, against the Spaniards who wanted to increase their grip on the western part of Florida. Campbell had brought with him from New York the 3rd Waldeck, a detachment of Royal Artillery and two Loyalist Corps (the Pennsylvania Loyalists and the Maryland Loyalists). In July 1778, the Waldeck regiment was accompanying and protecting the Pennsylvania Loyalists regiment. They were ambushed by the rear and sustained significant damages. NOTE. 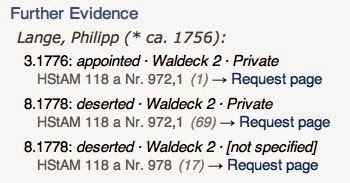 From the military file of Philip Lange in Marburg, Philip deserted the Waldeck regiment in August 1778. This fact is the key to understand why a private named Philip Long popped up during the Southern campaign. Did Philip really desert the Waldeck regiment to fight for the other side? If this event is hard to swallow for any descendant of the Long/Lang family, nevertheless, we cannot close our eyes on a military fact. Here are three screen captures taken from the Marburg Archives. When Major Campbell arrived in Pensacola with his troops, he met nothing but desolation. He was sent by the British to reinforce the resistance. Instead, he had to organize one. For over two years, the troops traded their guns for hammers and built a fort, Fort George. In September 1779, Spain declared war on Britain and conquered West Florida before Campbell became aware that he had, now, two enemies: the Continentals and the Spaniards. 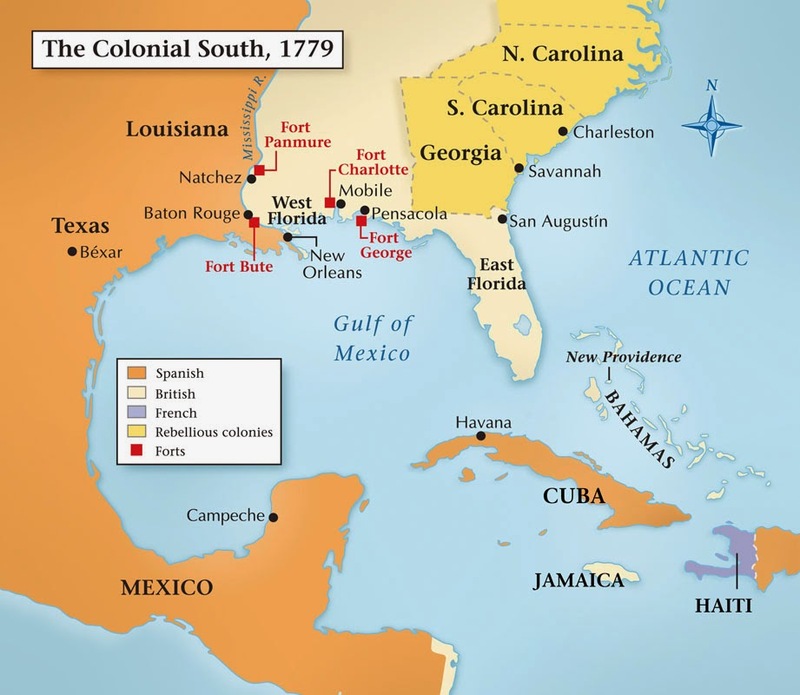 In March 1780, British fortifications around Pensacola were coming down one by one. Major Campbell became surrounded and isolated in Fort George. In January 1781, three years to the day after he had arrived in Florida, Campbell decided to send the Waldeck regiment in Mobile: the campaign was disastrous. In March, the Spaniards started a siege that ended on May 8th. A horrific explosion destroyed most of the fort and Major Campbell has no choice but to capitulate two days later in order to avoid more atrocities. The following muster roll of the West Florida Royal Foresters is mind-boggling. All of a sudden, a private soldier named Philip Long is described as « deserter » on May 9th with nineteen other companions. One day before the surrender of the British Forces in Pensacola, Florida, some soldiers managed to escape. They were not the only ones to desert, though. A total of 300 other soldiers left the fort in a hurry towards Georgia. Five months later, Philip Long enlisted in the King's American Regiment in Savannah, Georgia. They were the only ones who gave themselves a chance to freedom: more than 1200 were taken prisoners on May 10th. To understand why Philip and other soldiers « deserted » at Pensacola, it is necessary to learn more about the Battle of Pensacola through the eyes of historians. Numerous historians have described the battle and the siege of Pensacola. Barbara A. Mitchell is one of them. « On May 8, a howitzer blast, aimed from information given by an American loyalist deserter, hit the magazine at the Crescent redoubt. Black smoke billowed into the sky as the gunpowder supply exploded, killing 57 British troops and devastating the fortifications. Ezpeleta, commanding the light infantry, led a charge into the redoubt and then took it, quickly positioning howitzers and cannons to open fire on Fort George. At this point, most American loyalists and their Creek Indian allies deserted, leaving Campbell only 600 soldiers. The British returned fire from Fort George, but were overwhelmed by the Spanish bombardment. Realizing that their final line of fortification could not sustain the barrage, the British hoisted the white flag from Fort George at 3 in the afternoon on that same day. On May 10, 1781, the formal surrender was complete. The Spanish lost 74 men, with 198 wounded ». Mitchell, Barbara A. America’s Spanish Savior: Bernardo de Gálvez, 2012. Wilbur A. Siebert also wrote about it, and especially about the aftermath of that horrific blast. « Thus, nothing remained for the insurgents except to seek safety in flight. Accordingly, they gathered their families, horses, and movable effects together and fled to the can swamps. Thence more than one hundred individuals, besides slaves, set out on horseback, with their meager belongings and supplies packed on other horses, for the British settlements on the Savannah. 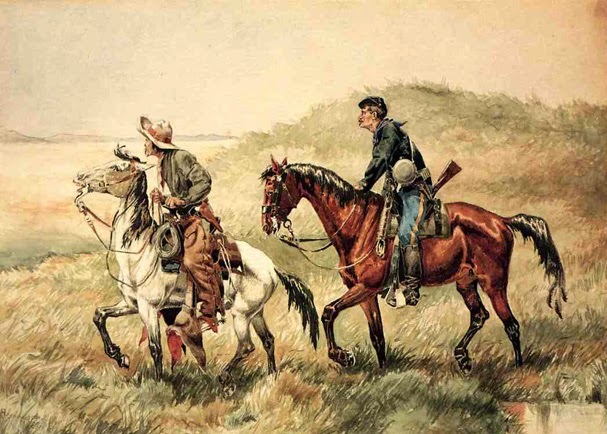 In the course of their wanderings, which lasted five months, they traveled over the prairies in the present state of Mississippi, suffering the pangs of thirst in a season that was unusually dry; they were deprived of their pack horses and plundered of their effects by hunting parties of Indians. Of those who were taken prisoner at Pensacola, some families were detained there on account of sickness. When they were able to depart, they were shipped to New York by way of Havana before the end of December, 1781. Bridadier General John Capmbell and Captain Adam Chrystie, the latter being the commanding officer of the West Florida Royal Foresters, may have gone with this contingent. There were 14 Royal Foresters, 68 Pennsylvania Loyalists and 137 Maryland Loyalists still at Pensacola on April 24, of the same year (1781) ». The raising of West Florida Royal Foresters. It is of utmost importance to know when the WFRF was raised. « The West Florida Royal Foresters was raised in 1780 with 43 soldiers at West Florida and was present at the Pensacola Siege ». « Governor Peter Chester of West Florida had organized a local troop of dragoons, called the West Florida Royal Foresters ». Philip Long was a member of this regiment in 1781. He could have enlisted in1780. There are no muster rolls for the period of 1780 to 1781. It is important to note that it was a regiment of dragoons (cavalry). Todd W. Braisted goes further than many authors. « Despite the many different small units raised in the Province of West Florida, this was the only one placed on the Provincial Establishment. Two cavalry troops were originally raised in early 1780, commanded by Captain Adam CHRYSTIE. Both troops were killed or captured during and shortly after the Siege of Mobile. A third troop, of new recruits and survivors of the first unit, was raised afterwards and served in the Siege of Pensacola. After their capture there, the few survivors were sent to New York, where they seem to have been disbanded in 1782 ». Braisted, Todd W. Loyalist Muster Rolls West Florida Royal Foresters. The On-line Institute for the Advanced Loyalist Studies, 2001. 7. Was Philip Long really at Pensacola? Ersten, for the first time the name of Philip Long is mentioned on a document, a military one. We know that Philip said that he got involved in the ARW in 1775. On his military file, it says that he was appointed to leave Germany in March 1776. As the first screen snapshot showed you, he was probably mustered sooner. There is not much room for interpretation here. Zweitens, he deserted the Waldeck regiment on August 1778, a few days after his Waldeck regiment was ambushed in Pennsylvania and suffered losses, not counting numerous soldiers taken prisoners. The Waldeck was protecting at that time the Pennsylvania Loyalists regiment. In July 1778, the Pennsylvania Loyalists lost also their supply train and their food. Those two regiments were part of those 10 000 more soldiers and civilians who left New Jersey and New York for Florida soon after, at least what was left of the Loyalist and British regiments. Philip deserted the Waldeck regiment before what came to be called, The Big Runnaway. Pennsylvania was the ideal area for a Hessian to disappear in the crowd, since Germans had been immigrating in that area for more than a century and even more so between 1725 and 1775. In 1775, immigration came to a halt. If my calculation is right, Philip disappeared from the radar for at least three solid years. Where was he during all that time? Was he hiding in Pennsylvania? Was he working for the Continentals? Did he desert one day, enlist in a Loyalist regiment the next day and join the others in the Big Runnaway? Since I don’t have any document to answer this question, I’m compelled to give you the following answer: « I don’t know! ». And, I will probably never know either. NOTE. I’ve known for a long time, as you do probably, that two other Philip Long were part of the Continentals: one in Pennsylvania and the other one in Virginia. Like me, you have gathered enough documents to demonstrate without any doubt that my ancestor is, in fact, a third Philip Long during the ARW, the Loyalist one. For instance, a Philip Long appears on Colonel John Bull’s Company on June 1777, a Patriot regiment. You can follow this same Philip Long, in other documents dated long after 1783. He even got a war pension: did you know that? Both of these Continental soldiers got war pension after the year 1800. Drittens, how is it possible that a deserter from Hessian regiments come back to reenlist in a Provincial (Loyalist) regiment? To answer this critical question, I called upon Mr. Todd W. Braisted. Who’s he? He’s the number one expert on Loyalist regiments during the ARW. to a Provincial Corps during the ARW? No, that would not happen. If they were discovered, they would be returned and no doubt severely punished. The only German regular soldiers (as opposed to officers) who ended up in Provincial units were those who escaped from rebel prison and made their way back into the lines and concealed who they were, or deserters who did the same thing. to reenlist in a Loyalist regiment in 1781, the WFRF. That answer of Todd W. Braisted is the second most important piece of information in my whole research, even more than getting the birth certificate of Philip Long. Why? Because I know that Philip Long was born one of these days, but I didn’t know why he had switched to a Provincial Corps in the midst of the ARW, and it was giving me a hard time. In fact, I found at least one other Hessian deserter who was a companion of Philip in the King’s American Regiment. I found also many privates with names that do not exist anywhere on this Planet, surely hiding behind a recently fabricated name like Futural, Landkarear, Taked. I’ll keep gathering information about this particular aspect. From my recent readings, particularly the writings of Rodney Attwood, I’ve realized that the word « desertion » had many disguises during the ARW, way beyond my expectations. Let’s just say that the hard-nosed Hessians officers became quite flexible and understanding on American soil. They went as far as giving permission to leave the ranks. Moreover, if the soldiers and officers didn’t get permission to stay in America, they would desert anyway. There is more. From other books, I found that the British officers had to fill their ranks with Provincial soldiers: regular soldiers were deserting at an alarming rate and recruitment was getting harder as the war progressed. The British and the Hessians finally realized that the lost of a single soldier was hurting. Corbett, Theodore (2013. No turning point: the Saratoga Campaign in Perspective. University of Oklahoma Press. An article from Don Hagist shows that Hessians fought side by side with the British regiments and also within British regiments. Hessians were part of most of the British regiments. I assume that this relationship would make it easy for a Hessian to desert to a Loyalist regiment. One other fact is worth noticing. The Hessians had many reasons to desert. Their pay was low and, sometimes, their salary arrived months after their due date. It seems that many Hessians were not paid at all: the regiment would supply them food, clothing and shelter. Their living conditions were so bad that they would make themselves trousers of the their old rotten tents. If you are tryiong to understand why there were so many desertions on each side, read about their living conditions. Viertens, on what terms did Philip was allowed to join a Loyalist regiment after he had deserted the Waldeck regiment? That also, we might never know. But, if you were bringing in to the British a bag of military mail that was to be delivered to Continentals officers, maybe it represented an acceptable « calling card », maybe…..
You surely remember what the censors Deane & Kavanaugh said in their 1831 report after they had met with Philip in Clair, NB. Let me bring back this screen capture. Their interpretation was that Philip was not in a British garrison, but on the Continental side, because he had « escaped to » the British. But, this is solely based on the interpretation that Deane & Kavanaugh made of their meeting with Philip. It’s funny though that it was written this way. If Philip had been, at that time, part of a British or Loyalist regiment, he would have said that he had captured a bag of mail « from the Continentals ». I guess that this event is opened to any interpretation after the fact. Go ahead and make your own interpretation of that « stolen mail bag ». Fünftens, how did he get from « Philipp Lange » to « Philip Long »? I will find the proper documentation on that matter and tell you about it on another section of my blog. Myself, I want to know how many of these Langes became Longs in America, because some of them stayed in America (USA) and North America (Canada). Of those Hessians who left, some of them came back. I’ll tell you about Johannes Lange who came back in 1836 with ten children, and I have a solid proof that he was a Hessian in the ARW. I already have more than enough documents concerning the Langs who immigrated to Pennsylvania and who became Longs. Those who kept their name as Lang were rather the exception than the rule. The Swiss immigrants and the German immigrants of Lutheran faith tended to keep, as is, their Lang name. There are many Lutheran Langs in Bethel and Lebanon Counties, for instance. In 2011, Todd W. Braisted, HVP UELAC, wrote an article about desertion in the Loyalists regiments titled, The American Vicars of Bray. It’s a mind-opener for anyone who is struggling to understand the concept and the practice of desertion during the ARW. Since his article is well documented from writings of people involved in the ARW, I consider his article to be at the same quality level as the one of Rodney Attwood on desertion. Consequently, since my ancestor was a deserter, his writings are of utmost important to me in order to come to grip with Philip’s own desertion. Moreover, I am very inquisitive about the lateral movement of Philip from one Loyalist Company to another Loyalist Company. Was Philip the only soldier to behave this way or was it a common practice to shop around for a better set-up? Braisted presents the case of Gersham Hilyard, a Loyalist soldier in the ARW. We know that Benjamin Franklin had a law voted in the Congress at the beginning of the ARW encouraging citizens to invite Hessians to desert to their side. 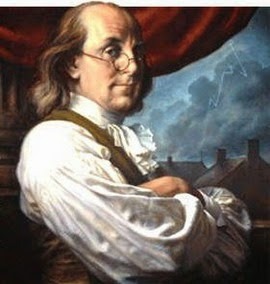 Once again, Benjamin Franklin lived up to his reputation of a genius in warfare. While deserters from the other side were a significant source of recruitment, there was another one also: the prisoners of war (POW). Braisted tells about another deserter within the ranks of the Loyalists. These deserters came in all sizes and colors. It seems that Philip Long was not any different from a good portion of those soldiers in the ARW. Braisted gives his own opinion of these so-called deserters. Braisted reported many stories of soldiers going from one Company to the next Company as if these soldiers were motivated by something else than the loyalty to the British’s Crown. What is it? I don’t know. 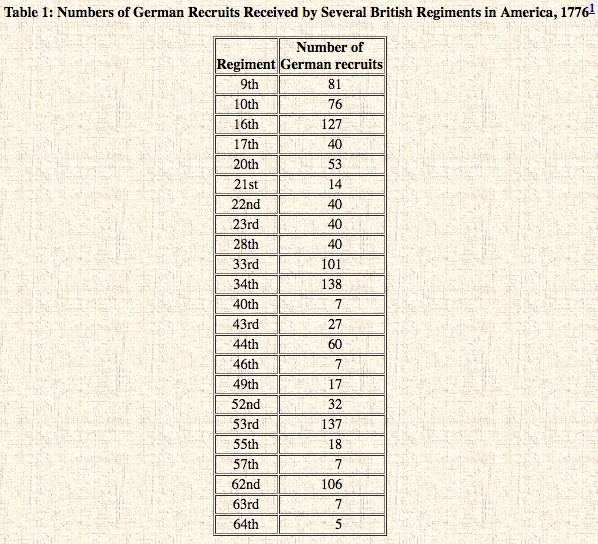 It is clear, though, that desertion within the Loyalists ranks was contagious, but not as much as on the Hessian ranks. Many Hessians came in America with the secret intention of deserting, a notion that is well documented. « While research into the subject continues, an examination into the rolls of 29 Continentals regiments, and incomplete documents of some others, identifies some 2,078 deserters, prisoners and missing in action from the end of August 1777 until the end of June 1778, the time of the Philadelphia Campaign ». Hundreds of families have devoted themselves to learn and write about their ancestor’s participation in the ARW. You can easily find these writings on the Web. Braisted is not the only one to tell about the living conditions of those soldiers. Learning about them helps us understand what life was for Philip Long as a soldier during the ARW. Surprisingly, I’ve heard of only one member of my family who made a significant effort to understand Philip’s life through readings of people of that era. That member is my brother Benoît. His writings, suggestions, conclusions and questions are sometimes shocking. Why? Because they don’t fit well with the traditional picture we have of Philip, a picture that I’ve always known to be a « filler » because of the lack of proper documentation about his real life. and a factual life story of a soldier.